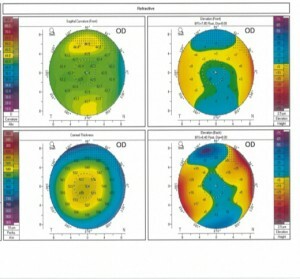  Fundus dilated Volk examination – typically myopic appearance however unremarkable. Mrs S prescription is too high for laser treatment. 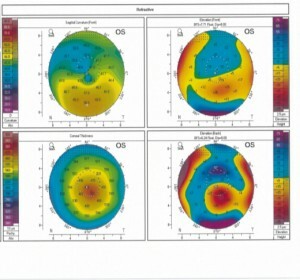 Keratoconus is also an absolute contra indication for laser treatment. 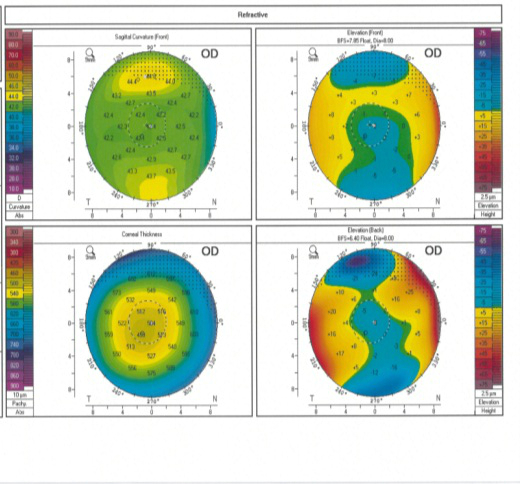 A Lens Replacement could be considered however due to the increased risk of retinal detachment with patients ’under 50 years of age, an Implantable Contact Lens was advised with collagen cross linking treatment first in the LE to address the keratoconus. Mrs S was delighted with her vision and showed a marked improvement in best corrected visual acuity in her left eye. High, complex prescriptions can be treated safely providing accurate ocular measurements are taken and patients are counselled carefully.